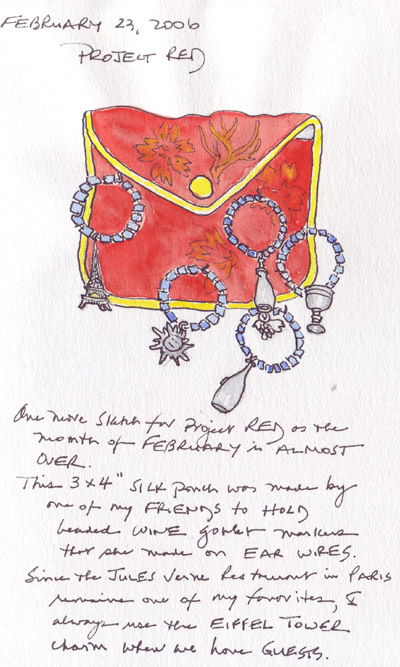 February was my month to experiment with my cadmium red and alizarin crimson W-N tube watercolor paints. I made several more sketches, but these are representational samples of the type of paintings that were done. 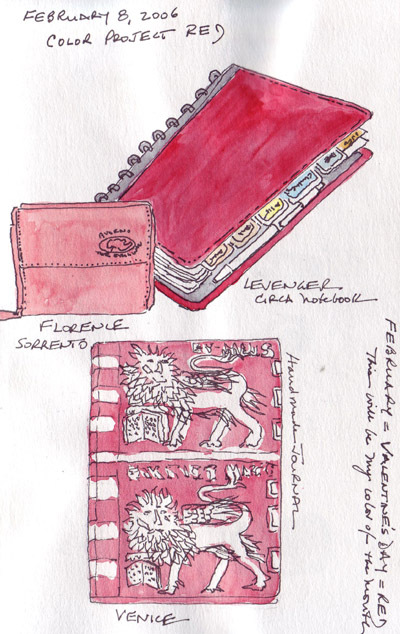 The "lion" journal, which I purchased in Venice, was done using a watercolor mask. I was pleased with the process because it actually looks very similar to the handmade cover - imprecise sketching and painting. Last Fall Laura F. shared her 2005 color series with the EDM group. I am such a novice with watercolor paints that I just made the change from student grade pan paints to Winsor-Newton artist grade tube paints. 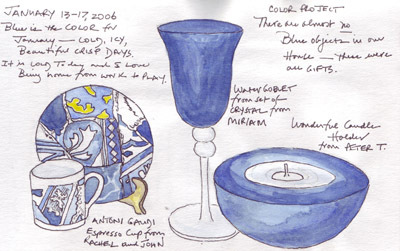 This seemed like a great time to play with color mixing (my favorite part), so I used blue to January - a frosty cold winter month in the Northeast. To learn how to mix colors using these two triads, I sketched objects in my apartment and tried to duplicate the colors for 6 months. 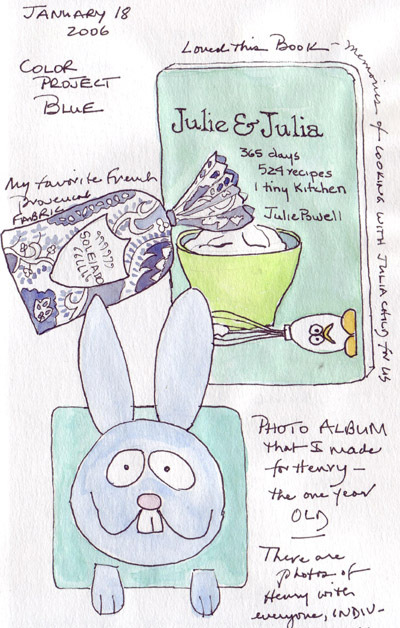 These are from January 2006, my Blue Month. This was a fun, quick, challenge drawing. 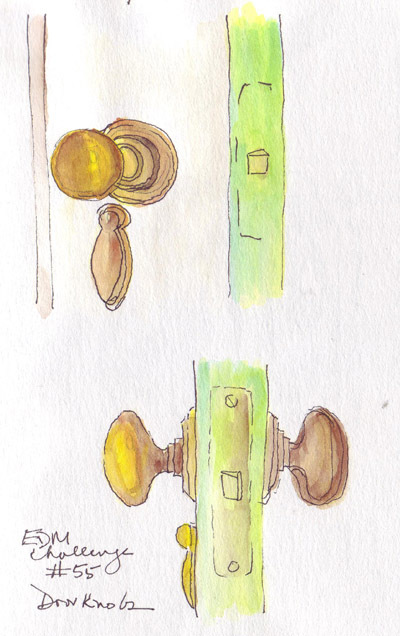 I went searching for unusual doorknobs but found more than 25 in our apartment that look just like this. If they weren't predicting colder weather this weekend, I'd search the neighborhood for a few that are more interesting to sketch. That will be a great project for spring! 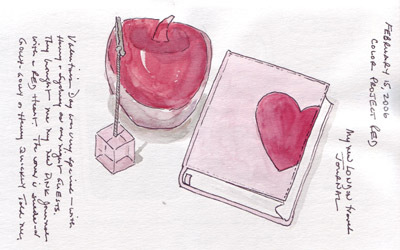 Valentines Day 2006: I love my 3 grandchildren more than words (or drawings) can express. My skills at portraiture are such that I'm disappointed when my drawings don't look like my subjects. After much thought this week, I decided to sketch "someone that each of them loves." 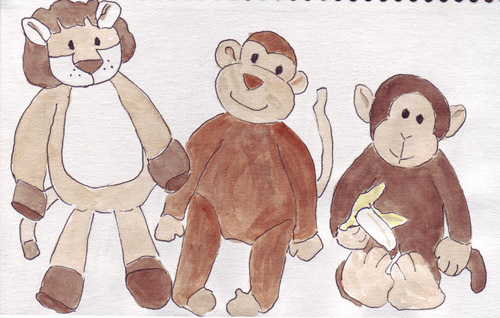 From left to right: 2 year old Henry's Lion, 13 month old Sydney's Monkey, and Mambo - 6 month old Robbie's monkey. Henry and Sydney adore their stuffed animals and bring them to Grandma and Grandpa's apartment for overnight visits. Robbie is still too young to have the same type of bonding with Mambo, but every month they have their picture taken together to chart Robbie's growth. I had several hours of sun at the beautiful Biltmore pool before the temperature in Florida plunged to the 50s and the blizzard of 2006 started in New York City. We actually had "snow envy" because we were missing the winter fun in Central Park. 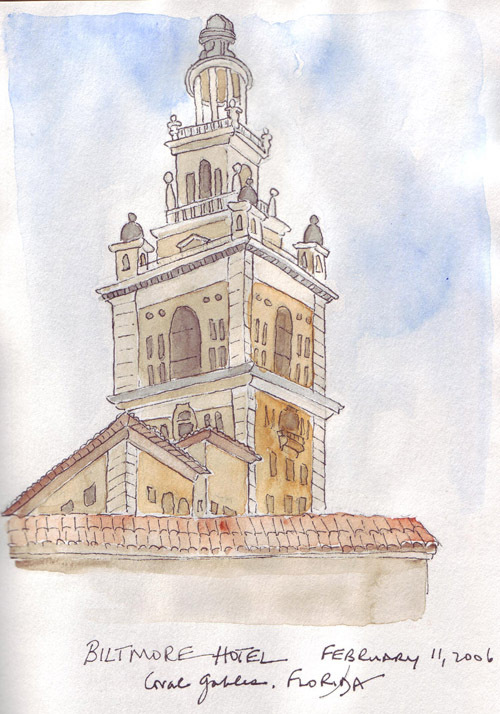 The tower on the beautiful old Biltmore Hotel must have been sketched and painted thousands of times, and it was a challenge for me to work on this 4.5 X 6" drawing. A hotel employee told me that many artists sketched it from the golf course, head on, instead of from this angle as it rises above the other rooflines of the hotel. This seemed like just the "perspective practice" that I need. 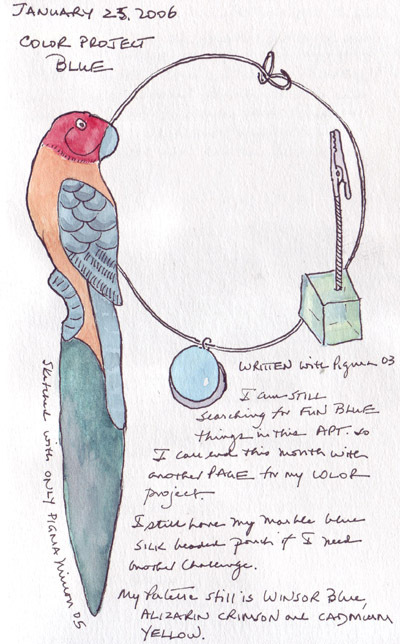 I used my new Daler-Rowney travel set of watercolor paints and medium and small Niji waterbrushes for the first time. These traveled well, in contrast to my Pigma micron pens which leaked during the plane ride.